Big news. Liverpool FC is up for sale. American owners Tom Hicks and George Gillett have appointed Barclays Capital to find a buyer. “Following numerous expressions of interest from third parties, the Club has engaged Barclays Capital to advise on the sale process,” a statement read on the club’s official website. “Owning Liverpool Football Club over these past three years has been a rewarding and exciting experience for us and our families. Having grown the Club this far we have now decided together to look to sell the Club to owners committed to take the Club through its next level of growth and development. 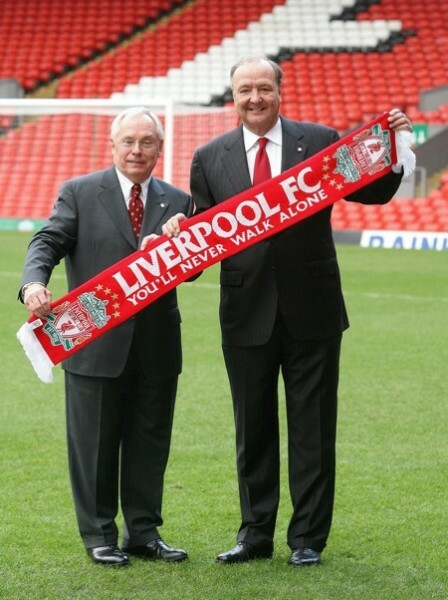 Broughton, currently British Airways’ chairman, has been appointed as Liverpool’s independent chairman with immediate effect and will oversee the sale process. Syrian businessman Yahya Kirdi claims he is in advanced talks about buying the club. Watch this space. At least he talks a good game. Happy now, Liverpool fans? I guess so. You got what you wanted. Is this news proof that concerted pressure by organised fans does work, eventually (H&G hung around Anfield for three years)? Or will this turn out to be a case of ‘be careful what you wish for’? yes yes yes yes YEEEEEEEEEEEEEEEEEEEEEEEEEEEEEEEEEEEEEEEEEEEESSSS!!!!! Damn it. I was hoping they would run the club into the ground. Long live Hicks and Gillett! Nice one. 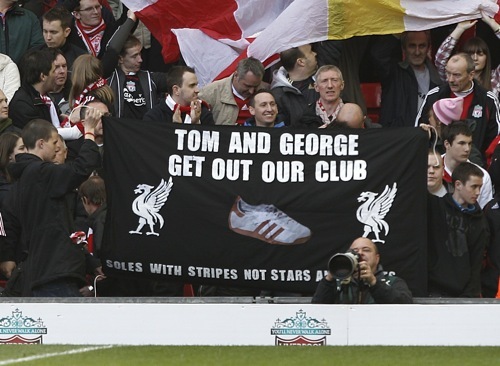 These yank billionaires have no place owning football clubs. Though I must agree with Mathers, I was quite enjoying the Liverpool circus they had created! Also, what the hell is going on in that top picture? Are those horrendous grammatical errors there on purpose?